Please join The Glenbridge Fine County Fare for their 5th Annual "Community Care Christmas". This year, from November 30th to December 31st guests can share the Christmas Spirit by hanging an ornament on the Glenbridge Christmas Tree to honour someone special in their life. Glenbridge provides the ornaments. In return, your suggested donation of one dollor or more, goes directly to The Prince Edward County Community Care for Seniors Association to support their programs to help seniors stay living at home. 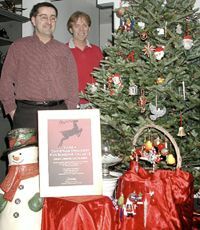 In the 5 years since The Glenbridge has held their annual "Community Care Christmas" over $5,000 has been raised. It's amazing what one dollar can do. The 5th Annual "Community Care Christmas" at The Glenbridge resulted in a donation of $888.00 to help seniors stay living at home. Photo by Janet Kellough, used by permission. From the board, staff, volunteers and clients of Community Care we extend to Larry Browne and Ron Girouard, owners of The Glenbridge, our most sincere thanks for your ongoing support of seniors. Mission: To operate exclusively as a charity to support and further the life, work and mission of The Prince Edward County Community Care for Seniors Association and to assist seniors residing in Prince Edward County to live at home.